Over the past several years, SharePoint has seen a huge level of adoption, with organizations of all sizes turning to SharePoint for their everyday portal and collaboration needs. As adoption has grown, organizations have started using SharePoint as a platform for business application development. According to a recent survey by Forrester, 52% of all SharePoint customers are building, or plan to build, custom apps in their SharePoint environments. While it has been common practice for some time, building custom apps in SharePoint has proven difficult, sometimes resulting in unstable SharePoint environments. To address some of these difficulties, Microsoft introduced the App Model as part of their SharePoint 2013 release. The SharePoint App Model provides a framework for building custom SharePoint apps while still maintaining the integrity of your SharePoint environment. While the App Model provides some great capabilities, many app developers find it difficult to use and are still searching for a better way to build apps in SharePoint 2013. 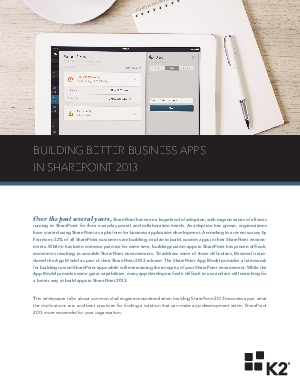 This whitepaper talks about common challenges encountered when building SharePoint 2013 business apps, what the implications are, and best practices for finding a solution that can make app development within SharePoint 2013 more successful for your organization.